What is it about our dogs? Is it the loving greeting you always get (even if you just walked out the door two minutes earlier)? Is it the floppy, soft ears or tails? What is it that prompts us (Americans) to spend more than $58 billion a year on our pets (American Pet Products Association)? In an industry where the financial costs of pet ownership are soaring, vet care, grooming, food, dog walkers, doggie day care (just to name a few areas), why is it that people so vastly undervalue training? The number one reason that dogs are surrendered to shelters across the country is behavioral issues (Cesar’s Way & Ohio state University Study). It leaves one to wonder why people are willing to spend thousands of dollars on dresses, collars and leashes for their pets, but not do the bare minimum to make their dog happy and healthy for a lifetime by training them? It’s as if we have created an acceptable process of considering our pets as disposable animals. That somehow finding the magic “one” that is already trained will just show up. I wish we could all be so lucky to have a dog that just automatically knows what to do and how to behave. There are two reasons I hear over and over again as the reason why people don’t want to train their dog: it costs too much or it’s too mean. Either reason is a poor reason not to train your dog. The first, yes, sure it can be expensive to hire a qualified trainer. I firmly believe the cost is much lower if you have a dog that responds to commands. It costs much more to provide for veterinary care for a dog that chases a squirrel into traffic or the street and gets hit, or bites another dog or even ultimately if they bite a person. I am not just talking about the financial costs of poor behavior, which can run in the hundreds to thousands of dollar, but also the emotional toll it can take on an owner as well: the stress, the anxiety, the fear of how your dog will behave all the time. As to the second reason not to train a dog, that it’s too mean- I find it much meaner to leave a dog stressed, anxious, fearful, and unable to relax at any given point because they have no other idea of how they can behave. Could you imagine living in a stressed out scared state all of your life? Never being able to let go of the fear and just enjoy life? That to me is completely unfair and cruel. Defining boundaries and rules for our dogs to live by successfully is the least that we can do since we put them in the home. It’s not as if dogs don’t define boundaries when they interact with each other. Dogs thrive when placed into a structured relationship – with their owners, other dogs. They have a sense of security that can only come with consistent expectations. In either scenario the cost is so great to the human and the dog. A small investment in training can provide a lifetime of security and peace of mind for everyone. That is the fairest thing I can imagine for a family with a dog. I want to enjoy my dogs all the time. Not just those private moments (that sounds wrong, but you know what I mean) but all the times and places that I take my dog with me. 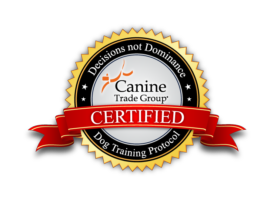 Training expands their world by allowing them to be trusted anywhere you go. That is freedom. That is peace. Train your dog, not just because it is the right thing to do as a member of your community, but because it is the right thing to do by your dog. Give them the freedom that comes with training. Keep your dogs in your home. Set your dog up for success and a lifetime of love. That is the fairest thing I can imagine.